In the room of the spirit, Janet Krauss fills all the seats. Paul Dry, Paul Dry Books, Inc.
A quiet energy burns in these highly crafted poems, which are generous in their metaphors and impressive in their range, moving nimbly from elms humming with sunlight to straphangers on a bus, a maimed war veteran, a Jewish cemetery in Prague—and always, everywhere, a reverence for what Janet Krauss calls the “sanctity of place.” As she browses through memories of her parents and children, or contemplates the paintings of Bruegel and Hopper, she plunges us into a world of birds, beaches, tides, seeds and gardens, a world in which “rainfall encloses intimacy / under an umbrella,” and the moon lies on the ground “like a silent, gasping fish.” A gripping, captivating collection, with haunting moods, and moments that have a way of lasting. In “A Poem About a Broken Bucket,” Janet Krauss writes that “The poem can be / the simple act of seeing / the wondrous thing.” This sense of wonder is her signature. Even though not all of her poems are optimistic, she has a sense of awe at life. It is not surprising that she writes about paintings, for there is a painterly quality to her work, which she creates both through mood and language. When she asks us, along with her granddaughter, to “listen / to the doves at dusk / in the whiteness of the sky / part the air / as they make troughs for dreams / with their murmurs,” we can’t help accepting the invitation. Janet Krauss is a far more complex and compelling poet than one might first surmise. The way she weaves art, history, family, nature and politics into an accessible mosaic leaves one spellbound and grateful. Plant trees for changing views. Arrange rocks around leaning grass. than a line of lanterns. eat the air he breathes. as he lifts his face to the sun. The carp rises in his head. 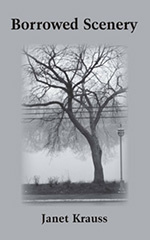 I find Janet Krauss’s new book, Borrowed Scenery, to be a stunning collection. Janet’s poetry is, like the best poetry, that flickering but steadfast light in the darkness. She doesn’t deny the darkness—that is, the pain and suffering of life, the loss that is an inevitable part of life; rather, her poetry holds up the frail but necessary illumination to help guide us in the night. In the transience that is life, her poetry speaks about the only permanence that is open to us—that of the immutability of art. Of poetry, of art, and of memory that is immortalized by art. In her poems we have vivid scenes of nature, but as in the greatest nature poets, and as Wordsworth himself reminds us, it is nature “recollected in tranquility.” Her poems focus on those rarefied and, as she calls them, “sacred” moments—often decades earlier—when we are able to recapture, through nature, our own childhoods, the childhoods of our children and grandchildren, the sacred moments of our parents, of watching boxing and baseball with a father, those moments when we were distant echoes of who we are now. As with the best poetry, hers is on intimate terms with loss. Yet she doesn’t give into it, doesn’t fear it or shun it; in fact, she acknowledges it, accepts and invites it, and asks for no quarter from it. And she offers us the only thing poetry can; the fragile illumination, the joys despite that loss, the knowledge that it is only in the struggle to live life in the face of loss that we are human, and made more deeply human for it. As she writes in “Disappointment,” “In its time it will wean itself away.” But I can promise you this one thing: in her poetry you will not be disappointed. Janet Krauss grew up in Boston, Massachusetts, graduated from Girls’ Latin School, received her BA from Brandeis University and her MA from Fairfield University. She is a widely published poet, and has been twice nominated for the Pushcart Prize. Her work reflects the need through love of language to comprehend situations, scenes and feelings that affect her. Nature and art help her express her ideas and family experiences. Through her poems she hopes to gain a kinship with her readers and belong to Hawthorne’s “magnetic chain of humanity”. She teaches literature and writing at St. Basil College and Fairfield University and lives in Bridgeport, Connecticut with her husband, Bert.